What if someone told you that the best way to slow global warming is to pollute even more over the next 40 years? You’d say he was crazy, a climate change denier or worse. Yet this is exactly what legislation introduced by Maine Sen. Angus King would do. King’s bill, S. 1284, which clarifies “the treatment of carbon emissions from forest biomass, and for other purposes,” promotes cutting forests and burning wood to generate electricity as a replacement for fossil fuels, primarily coal, under President Barack Obama’s Clean Power Plan, the strategy for reducing carbon emissions from the power sector by 2030. Promotion of home state industries is understandable, although less than inspiring. But in this case the legislation goes much further and legislates bogus scientific “findings” about the climate impacts of burning wood, specifically defining wood-burning power plants as having zero carbon emissions. Behind every special interest favor there is usually a real problem to resolve, and this case is no different. 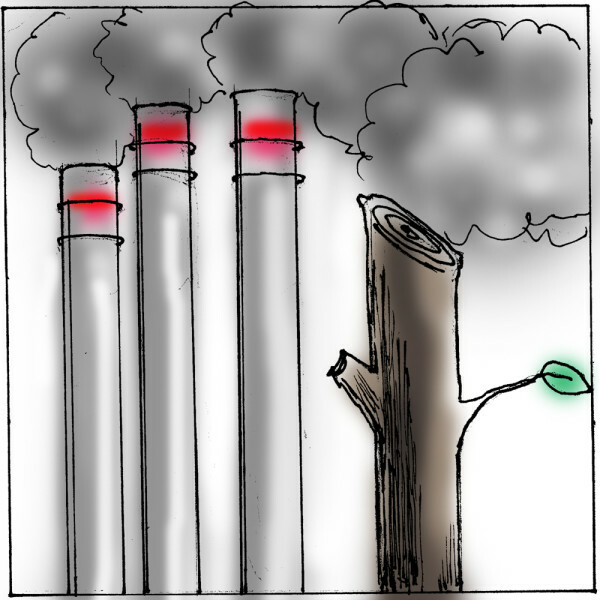 The issue is how to count carbon pollution from wood-burning power plants. The answer will have a huge effect on real-world programs to reduce carbon emissions in the U.S., and globally. King’s bill advances the industry assertion that wood burning generates zero emissions. If only that were true. To the contrary, it is a physical, measurable fact that wood-burning power plants emit about 50 percent more carbon dioxide per megawatt-hour generated than a coal plant; 3,000 pounds for wood as compared to 2,000 pounds for coal. The only question is, how long will it take to regrow the trees and recapture the carbon pumped into the atmosphere when those trees were burned? That is a legitimate scientific question, one that has been looked at by the state of Massachusetts and is under active review by the Environmental Protection Agency’s Science Advisory Board. In Massachusetts, the state concluded that the climate impacts of burning wood were worse than coal for 45 years, and worse than natural gas for about 90 years. Only after many decades might regrowing forests recapture enough carbon to make burning wood better than these fossil fuels. It would take well over a century of regrowth in Massachusetts forests to approach net-zero carbon emissions, or carbon neutrality. The result of this review was not a calamity and certainly not a ban on wood-burning power plants. Far from it. Instead the state simply decided that wood-burning power should not be subsidized by taxpayers alongside solar and wind because wood burning does not reduce carbon emissions in a timeframe relevant to the state’s carbon reduction goals. Now it seems as though the nation has arrived at the same decision point Massachusetts faced several years ago: How to account for carbon emissions from wood-burning power plants as we seek to reduce carbon emissions over the next 15 years. We don’t have an answer yet to that critical question. But there is one thing that we do know. The answer will not be found in a piece of legislation. It will be found through a transparent scientific evaluation of the facts. Passing laws declaring that wood burning produces no carbon emissions is no better than passing laws declaring that the sea can rise no more than 8 inches. Both seek to deny the science at the behest of special interests. Both are demonstrably wrong scientifically, which is probably not surprising. And both would keep us from the informed decisions about reducing carbon pollution that we so desperately need to make. King usually does the right thing on climate. He should withdraw this legislation and leave decisions on the impact of burning forests up to scientists, not the industries that stand to benefit from the fantasy that biomass carbon doesn’t warm the climate. Mary S. Booth is an ecologist and director of Partnership for Policy Integrity, which uses science, policy analysis and strategic communications to promote sound energy policy. Correction: An earlier version of this column referred to the wrong bill sponsored by Sen. Angus King.